How To Know When To Take Action On Personal Debt. If you are trapped by the burden of debt you probably have questions, but too embarrassed to ask for advice. It can be a hard topic to bring up to family or friends. The thought of the financial hardships you might be encountering are keeping you up at night and causing a lot of stress. We speak to clients’ everyday about their debts. 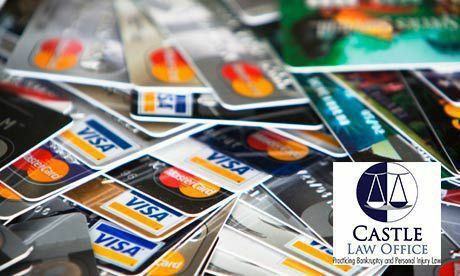 Talking about your debt with Castle Law Office might be exactly what you need to start a financial fresh start. Debt is a topic that is hard to talk about, so we wanted to provide some answers to some of the questions you may have. When Do I Declare Bankruptcy? For some people, the word bankruptcy strikes fear in them. Bankruptcy does not by any means bring a negative outlook on anyone’s character. It is a way to restructure your debts and feel free. Over the years, many celebrities have filed for bankruptcy and they have simply moved on. Last month over 70,000 Americans made the step to relieve their financial stress by filing either a chapter 7 or chapter 13 bankruptcy. Only making minimum payments on debts. Not able to put money into a savings account. To add to this list is the fact that maybe you have fallen behind on your bills and now your phone rings off the hook due to creditors calling all day and all night. If you have any of these scenarios we would highly recommend you calling Castle Law to set up a free consultation. If this you have some of the scenarios stated above, then it would be a good step forward for you to simply come in and talk to our bankruptcy attorneys. We will sit down with you and go over your debts and assets to determine which chapter is best for you and build a custom solution for you based on the bankruptcy chapter that is best for you. What’s The Difference Between A Chapter 7 and Chapter 13 Bankruptcy? Chapter 7 is a way to eliminate your debt and also liquidate any assets that you may have. Chapter 7 takes a lot less time to complete, the fees are a lot less than Chapter 13, no monthly payment and it eliminates your unsecured debts like credit cards, medical bills, payday loans and personal loans. Click here to read the benefits of chapter 7 bankruptcy. A Chapter 13 is a great option if you have assets that you want to protect in a bankruptcy. If you are facing a foreclosure a Chapter 13 is a great way to stop the foreclosure from happening. During a Chapter 13 you will also be able to eliminate your debts that you may have in monthly payments that you pay off over a time of three to five years. Click here to read the benefits of Chapter 13 Bankruptcy. If you find yourself wondering what life after bankruptcy would be like without all the debt hanging over your head, call Castle Law Office at 816-842-6200 to speak with an attorney. Or you can email us and schedule your free consultation.